The Internet has brought about a drastic change in the lives of entire human race. Things have changed for the better. Thanks to the rapid development of science and technology! The Internet is a life savior for many but among all of them the most important groups that are getting benefitted are the students, shopaholics, and business entities. The Internet is one place where information related to academics is easy to get. Most of the times when students are finding it hard to understand anything they are first referring to the Google search engine instead of their teachers and professors. In the same way, shopaholics are no more going to various shopping malls for purchasing clothes and accessories instead they are having it ordered on the Internet. Thanks to the era of digital marketing business! Businesses these days have got an online presence in this virtual world. Nowadays, most of the customer acquisitions are done via the Internet. Marketing campaigns have also become very much cost-effective and productive through the medium of Internet. This is the reason why every business entity irrespective of it being small or big maintains a website on the Internet domain. Designing a website is not a piece of cake and it cannot be done just anyone and everyone. Websites are designed only by IT professionals. However, to design websites the time taken is generally in months. At times, clients are not totally satisfied with the firsthand job done by their hired web designers. 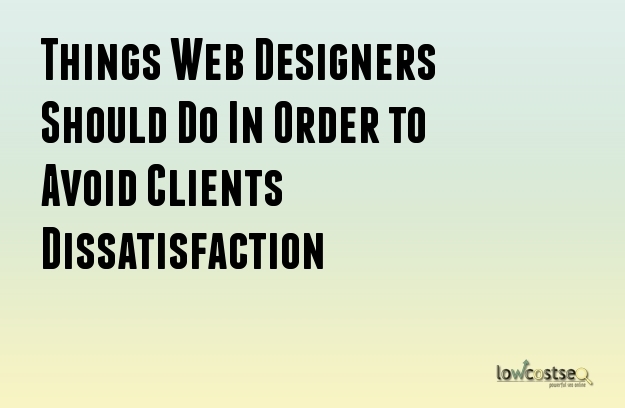 So, how can clients annoy their web designers? Here are few ways as to how they do it. Most of the clients are unaware of the type of website design they are actually looking for. It is only when a designer prepare a rough sketch of the website design the clients opens up about what he or she wants and he or she does not. Common questions that are faced by most of the web designers from their client are: The color of the web page that has been selected is not eye-catching. Some ask to use software applications which are convenient for them to use and edit and not difficult ones like WordPress. This is the reason why it is important that all web designers should create a book of rules in order to protect themselves from such inconvenient situations. Here, is what should be included in the book of rules. Always make the client sign a contract before delivering the project to you. The contract should consist of specific dates and deadlines regarding the delivery of the project. Make sure that you too sign the contract. Before you send a mockup do send the client a wireframe. Do ask the client to send you some examples as to how he or she wants their website to be designed. Make sure that you ask for details as to how he or she wants their website to be designed. Make sure that they send you examples of website designs that he or she does not want. Once a website design has been finalized by the client make sure that you get a contract signed that he or she has liked the design will pay for it on an hourly basis.